Jean Mc Conville : The dogs on the street know who did it. | Vixens With Convictions! Home › Uncategorized › Jean Mc Conville : The dogs on the street know who did it. There couldn’t have been a more intimidating sight to the children of Jean Mc Conville than the scores of republicans who turned up on Saturday afternoon, and who congregated at the top of Derby Terrace in the Divis estate in West Belfast, and spilled onto the Falls Road to listen to speeches at the unveiling of a wall mural dedicated to the Sinn Fein leader, Gerry Adams. A few yards up again, old comrades of Brendan Hughes, from D Company, or “the dogs”, as they were locally known, were out with flags and black regalia, commemorating in the memorial garden. Graffiti had also appeared that week citing “Boston College Touts”, in strategic places on the Falls Road. Intimidating, because Michael McConville had that weekend, given an interview to BBC Radio Four, in which he stated he couldn’t hand the names of those who he believed to be involved in his mother’s murder to the police, because he “would be shot”. Sickening, because the location of the rally, and the wall mural, is a few hundred yards from where Jean McConville was dragged from her home, in front of her screaming children. 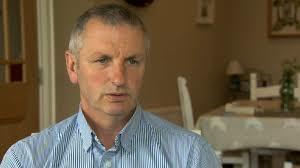 At that rally held by Sinn Féin, a former IRA head of Intelligence, Bobby Storey – now the chair of Belfast Sinn Féin, told the gathered crowd he was sending a direct message to both governments and the “cabal,” adding the following phrase “we aint going away, you know”. Those were carefully chosen words. Bobby Storey should be asked to clarify them. There was no public outrage at this fact. A few newspaper columnists picked up on it, but there were few hard questions asked of Sinn Féin about the perceived threat to Michael McConville, which he had explained publicly the previous day. Sinn Féin used their brass neck to hold a rally where they turned the victim in the Jean McConville case from the widowed mother of ten who was murdered, to Gerry Adams. Key figures made sure they were in attendance. There, was Sue Ramsey, seen laughing and joking with her sister, father and other close friends. There, was Martin Mc Guinness, suited and booted. 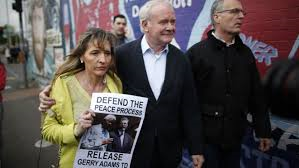 There, was Martina Anderson, looking like a grief stricken woman, forlorn and clutching onto a poster of Gerry Adams with Nelson Mandela, looking, for all accounts and purposes like a relative holding a missing person poster. The irony was not lost. Are Sinn Féin completely devoid of all traces of humanity? Gerry Adams, by that stage, had only been away from the republican family for a matter of days. Jean Mc Conville, the real victim in this case, in case anyone had lost sight of that fact in the resultant Sinn Féin spin, had been missing for years from her children. She is 42 years dead this year. Her body wasn’t found until 31 years after the IRA secretly buried her after breaking her bones and shooting her dead. Her children were all split up and taken into care. The effects have been far reaching across the Mc Conville family, and they continue to this day. What ordinary decent person could be failed to be moved by their plight? But – for Sinn Féin, it wasn’t about supporting the McConville family in their search for justice and accountability for their mother’s murder. It was about making a martyr and a victim out of Gerry Adams. It was about applying political pressure to try and thwart the criminal investigation. It was also about an election campaign. Adams gave a press conference, flanked by key election candidates under a Sinn Féin election poster. Wall to wall coverage resulted. The press conference by some of Jean McConville’s children was swallowed up in the media furore. Michael McConville should have nothing to fear from the IRA. He is publicly protected in the sense that should anything happen to him, people will know exactly who was behind it. Republicans are not stupid. They have succeeded in the short term, to have their leader released to the delight of his supporters. However, the court of public opinion will be with the family of Jean McConville throughout the rest of this murder investigation. Sinn Féin should report the names of those who were involved themselves to the police, in a show of solidarity with Michael McConville. If they really do support policing, what’s the problem? After all, the dogs on the street know who did it. ‹ Jean Mc Conville investigation – Gerry Adams arrested. ”Sue Ramsey was seen laughing and joking with her sister” and…? The writer was making the point that while key Sinn Féin personnel enjoyed family time at a rally for Gerry Adams – at a spot less than 200 yards from where Jean Mc Conville was abducted, the Mc Conville family do not have the luxury of doing that. Very good article, but who’s the vixen with convictions who wrote it? I do not believe it was the intention of the people who attended that rally to intimidate the McConville family as is suggested in this article. If McConville’s watching it on t.v felt intimidated that is regrettable but I feel someone should note few if any people want to add to the pain that family has suffered. Whether you agree that Adams’ should have been arrested under the ‘prevention of terrorism act’ and interrogated about IRA membership (after they exhausted their limited evidence of his involvement in Jean McConville’s murder) or not, I believe the vast majority in attendance were motivated by a dislike over the nature of Adams’ arrest. As for Bobby Storey’s comments it was a veiled threat to the British state in order to ‘calms the nerves of their grassroots after Adams’ arrest. Now we can go into the rights and wrongs of that but I think it is embellishment to suggest it was a threat directed toward the McConville family. You are correct in your assertion Michael McConville is protected in the sense that should anything happen to him, people will know exactly who was behind it’ . An important point not mentioned in this article is that One of Jean McConville’s daughters has gone to the P.S.N.I with the names of the people she believes murdered her mother. For what it is worth, many Republicans are deeply ashamed of what the IRA did to Mrs. McConville. Finally I still think the comment about Sue Ramsey is unfair and erroneous. Are you seriously suggesting that she is disallowed to share a laugh and chat with her sister due to the horrible murder of Jean McConville 42 years ago? Was it the case that you wanted to criticise as many Sinn Fein members in attendance as possible but were unable to conjure up anything tangible so you threw in a lazy comment about her laughing with her sister. My Aunt’s husband was shot dead in 1975 I don’t recall her ever suggesting I don’t laugh or share a joke with my sister due to her dreadful loss. Interesting take, but you miss the point of the article completely. Holding an over the top rally less than 48 hours into the arrest, a short place from where Jean Mc Conville was abducted speaks for itself. Helen Mc Kendry has indeed stated that she would pass on names, Helen Mc Kendry was not present during the abduction, Michael Mc Conville was and as such her evidence would be viewed as hearsay. The comment re Ms Ramsey was to simply illustrate that while some can enjoy family relationships, the Mc Conville’s do not have that luxury. She is a key figure in Sinn Féin, and as such, is as notable by her behaviour as Mr Storey was with his. We could have reported her jokey comments on the day, we chose not to. No I did not miss the point of the article at all I just disagreed with some of the points and did not like some of the points. Much of the ‘evidence’ against Adams could be viewed as ‘hearsay’ as you say Helen McKendry’s evidence could be viewed. Presumably that is why he was ultimately released without charge. Another point deserves to be made. If a person voluntarily presents themselves at a police station do the police really need to make an arrest? Furthermore if the police do need to arrest the person who volunteers to show for questioning is there a definite need to arrest under the draconian ‘prevention of terrorism act’?? I would like to know what evidence was presented to the judge to justify detaining Adams for an extra 48 hours because two days later the P.S.N.I still did not have sufficient evidence of a crime to charge him. The location choice for the rally was insensitive although it should be pointed out that the area was chosen simply because that is where the murals are and they wanted to paint a new one. Insensitive yes, but i don’t think it was a deliberate intent to offend. Also that specific area saw the violent deaths of a huge number of people during the troubles which probably deserves a note too. I appreciate your article as a timely reminder of the over-arching fact of recent events involving Gerry Adams – the evil beating (before her abduction), abduction, torture and murder of Jean McConville. The 10 children. Abandoned, traumatised, separated, psychologically scarred for life much as they have made valiant efforts to overcome. Those IRA people who ordered this and did this, everybody involved, are a deep source of shame to those IRA people who rose up against the British occupation in the Easter Rising and gave their lives or suffered deeply for a free Ireland. Those IRA people are a deep stain on Irish nationalism in its true sense. However, that does not mean the recent events involving Gerry Adams somehow reflect only a concern for justice for Jean McConville. I believe Sinn Fein are correct to some extent in identifying a political agenda behind this on the part of some. I have no idea whether Gerry Adams gave the order for the atrocities committed against Jean McConville (and others). But the fact is while justice must be strived for, in a society of the rule of law there has to be more to make Gerry Adams stand trial and be convicted. Ther are significant legal questions about using those Boston College interviews as evidence. It is fair to be sceptical about Brendan Henderson’s interviews where he blames Gerry Adams and also asserts that Jean McConville had a radio transmitter in her flat. He claims she was warned to stop, and then abducted when supposedly she didn’t stop helping the British yet the time between her beating and abduction apparently was short. Evelyn Gilroy likewise asserts that it wasn’t know about Jean McConville’s 10 children – even though the IRA knew where she lived, who her deceased husband was, and knew her movements in the community. Various people who are not the McConvilles or victims of thugs who maimed, tortured and murdered for the supposed ‘good’ of Ireland, have old scores to settle with Gerry Adams. Including those IRA such as Evelyn Gilroy who prefer to attack Gerry Adams through the media instead of admitting that the Peace Process to which he was and is integral is preferable to the vicious circle of The Troubles. The Beat Poet Alan Ginsberg in a different context wrote “I saw the best minds of my generation destroyed by madness”. That is the bitter legacy of British policy from centuries ago in Ireland to The Troubles in modern times, a bitter legacy for Irish of all backgrounds. Yet the Peace Process has offered a viable alternative if not one that can satisfy everybody or bring total light out of darkness. If Gerry Adams is guilty of ordering the death of Jean McConville then he and those who carried out the orders including Jean McConville’s beating as well as her abduction, torture and murder must be subjected to the due processes of the law. Irrespective of how old the participants were at the time. But the other agendas that surrounded Gerry Adams’ interrogation and the timing of it should be questioned. Thank you for taking the time to post your comment. Recently on Irish radio Jude White, whose mother was killed during the conflict, said if he found out the name of the loyalist who killed her he would not give it to the PSNI (the police). As far as he is concerned, the peaceful political agreement supersedes the violent military conflict. White regards his mother’s killer as a victim of the conflict. Other victims do not take that approach, for instance Anne Travers. Her sister was killed by the IRA who were targeting her father, a magistrate, who was injured. Anne Travers’ perspective is possibly reflected in the article above. White and Travers sit together on a victims body. Their differing narratives are equally valid and deserve equal respect. In my opinion, re-criminalising the past over a violent conflict in a sectarian state, characterised as a criminal enterprise by the British government in the first place, will not lead to closure. It will lead to more conflict. In other words, the process of criminalisation is contested. One reason is that the role of the British state in colluding in illegal killing, or in doing it, will never receive the same official consideration. The process is and will continue to be one sided, as currently pursued. Truly horrible things were done during the course of 30 years of violence. One of them happened to Jean McConville. One of them happened forever after to her remaining 10 parentless children. It is just and it is proper that Jean McConville’s children be allowed to find out what happened. Arresting people will not do that. Instead of obtaining justice it will create a sense of injustice, of one-sided justice in which the scales are tilted. A truth recovery process in which the state and all sections of civil society participate as equals, and in which the threat of incrimination is removed, has some hope. We have a Judicial System here which will work if allowed so no need for a Truth Recovery Process which will simply benefit those who were guilty of War Crimes and no guarantee of Truth. Quite a lot of moderation….